Provide comfort for the family of Ronald Smith with a meaningful gesture of sympathy. 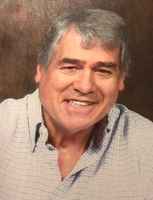 Ronald Patrick Smith, 68, of Bushnell, FL, passed away Tuesday, April 9, 2019, at Lane Purcell Hospice House in Sumterville, FL. Ronnie was born in Detroit, Michigan to Edward and Lillian Smith. He was a faithful member of St. Lawrence Catholic Church in Bushnell and was a member of the Knights of Columbus. Ronnie enjoyed feeding the ducks and birds. He is survived by his mother: Lillian Smith; sisters: Kathleen Coe of Kentwood, MI, Amy Wade (James) of Bushnell, FL; brothers: James Smith (Sandra) of Algonac, MI, Roy Smith (Cheryl) of Cottrellville, MI, David Smith (Diane) of Casco, MI; son: Matthew Smith of Garden City, MI; grandson: Orion Smith of Garden City, MI; and many nieces and nephews. He was preceded in death by his father, Edward Smith. In lieu of flowers, please consider a donation in his memory to Lane Purcell Hospice House (Cornerstone Hospice), 2452 CR 526E, Sumterville, FL 33585. A visitation will be held on Monday, April 15, 2019 from 6:00 to 8:00 p.m. with a Rosary at 7:00 p.m. at Purcell Chapel. A Mass of Christian Burial will be held on Tuesday, April 16, 2019 at 8:30 a.m. at St. Lawrence Catholic Church with Father Waldemar Maciag officiating. To send flowers in memory of Ronald Patrick Smith, please visit our Heartfelt Sympathies Store. Provide comfort for the family of Ronald Patrick Smith by sending flowers.